Helping women awaken to their true power and potential, and achieve wholeness in the process. We made it, we got through the intensity of 2017 and we are now ready for 2018! Woohoo! This year I want to start doing something a little differently. I want to start sharing with you a little bit more about myself, my life, and ways that I support me. I’ve had some new interests which I’ve been exploring on YouTube (like how to do fancy makeup ;) ) and I watched a video where one woman shared about her morning and evening routines. I really enjoyed it and it inspired me! 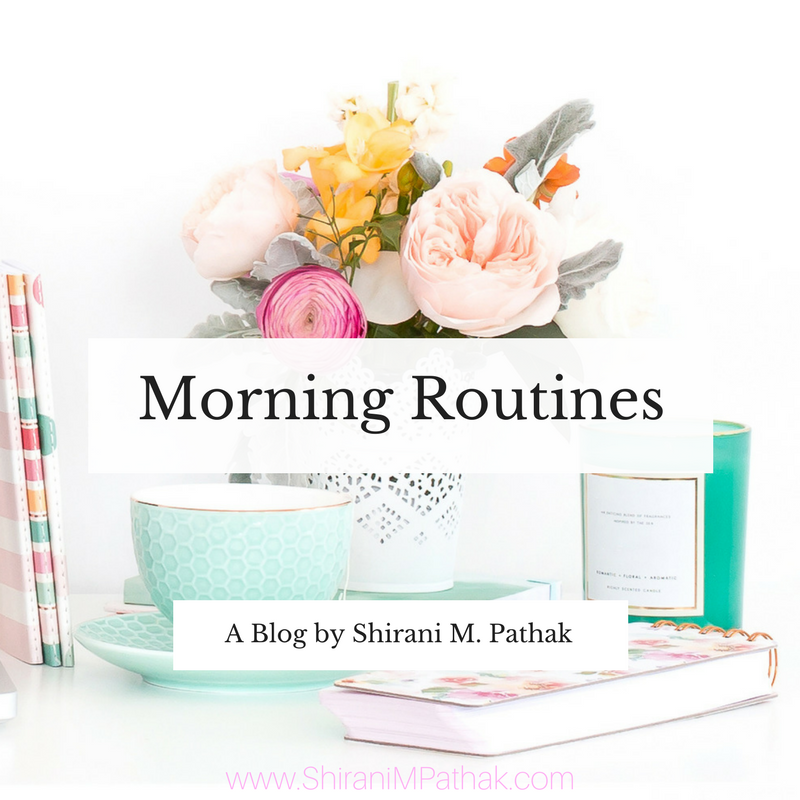 So for today, I want to share with you some tips, trick, and tools for setting up a morning routine, and share with you about mine. Morning routines are incredibly helpful in setting up the tone of the day. The trick is, they don’t start in the morning. Morning routines actually start the night before. When we take time to do some preparation the night before, we can really set ourselves up for greater success the next day. For me, that looks like making sure the hot water pot is filled, so when I wake up, I can simply click the on button then hop into the bathroom. When I was working for someone else, it looked like making sure my lunch was prepared and in the fridge, ready for me to simply put in my lunch bag in the morning. Okay, now, on to the morning itself. I used to think I am not a morning person and a friend re-framed it for me by sharing with me the thought that it sounds like I actually am a morning person, mornings are simply for me. That resonated so deeply for me! I don’t do well with others in the morning because I really need some time to get myself going. That’s why I don’t start seeing clients in the office until 1 pm. What I need in the mornings is time for conscious connection with myself and my Higher Power, a Divine Source of something greater than me. First I’ll share what my mornings look like, then I will offer suggestions on how this can look for those who don’t have the option of waltzing into the office at 12:50 pm. J And I’ll start off by saying, I’m not perfect and not every morning looks like this, this is what about 95% of my mornings do look like however. I let my body wake naturally. Sometimes that’s 7 am, sometimes that’s 8:30. Usually it’s in the 7:30 to 8:30 window. Once I wake I give myself time to lay there (I have discovered my body really needs one hour to get started). In the time I am laying in bed awake, the first thing I do is pray. My opening prayer is simple, “Thank you God for this beautiful day.” That’s it! Usually from there I go into my longer prayers, thanking my bed, thanking my guides, thanking my crystals that support me on my nightstand. Then I shift into prayers of being of service. Allowing myself to be of service to God’s Will, not mine. Saying the prayer from A Course in Miracles, “Dear God, where would you have me go, what would you have me do, what would you have me say and to whom?” Then I ask to be an instrument of God’s love today to everyone I come across. Then, I ask God to bless everyone I may come into contact with today, everyone they may come into contact with today, everyone they may come into contact with today, etc, and finally, blessing the whole entire world with God’s peace light and love, in a balanced, resourced, and aligned way. Finally, right before I get out of bed, I ask God for the knowledge of His Will for me, and the power to carry that out. Before I sit in quiet contemplative meditation time, I pour myself a glass of warm water. Sometimes I add in a squeeze of lemon, sometimes I drink it plain. I find that it hydrates me and really helps me feel good. After I come out of the silent time, I have some inspirational readers I read out of. They range from recovery literature, to Marianne Williamson, to A Course in Miracles. I used to feel like I had to read them all. Now I check in with which ones call to me and go from there. Upon completion of prayer, meditation, and daily inspirational reading, I pop into the kitchen, make some breakfast, prep my lunch, then hop into the shower to get ready for the rest of my day. Sometimes I add in gentle physical movement, like yoga at home or a walk, depending on what my body is asking for. So there you have it, my morning routine! For some of you this may seem like a luxury, and one of the things I have come to embrace is, my morning prayer and meditation really is a part of my work in the world. I am here to create, to innovate, and to help people heal. I have a message to share with the world. When I am too in my head (read: too in my own way) to hear the guidance clearly, I have nothing to share with the world. So for me, my morning routine is a part of my work. I am so blessed. And not only am I blessed, each of you is blessed as well, because we all have the same message to share: the message of love and belonging. When you take time to connect in and get right-minded in the morning, you can move through your day doing your true work in the world of carrying the message of love to those you meet as well. 1. Get things prepared for the morning the evening before. 2. Get to bed at a decent time. 4. Take a few moments to sit still and pause. Don’t check your email or social media first, check your connection with a Source of something greater than you first (ask yourself, is it email/social media or is it God/the Universe?). Instead, take a few mindful deep breaths and allow that to wash over you. Morning rituals are great and all, however, they are no good if you can’t carry the feeling of peace and calm with you throughout your day. Make a conscious decision to carry the feeling of peace and stillness with you as you move through your day, connect back in with it as often as you need, which you can do by simply taking another pause and a few deep mindful breaths, and forgive yourself when you don’t do it perfectly. We are human after all, perfectly imperfect. What are some of your favorite morning routines? Leave me a comment below to share with me. After you sign up for my newsletter, feel free to hop on over to watch my most recent Facebook videos to help you continue learning how to be a safe harbor in your relationships. This information is being provided to you for educational and informational purposes only. It is being provided to you to educate you about relationships, spirituality, and healing and as a self-help tool for your own use. The information on this website is not medical or mental heath treatment and does not create a therapist-client relationship. This information is to be used at your own risk based on your own judgment. For my full Disclaimer, please visit www.ShiraniM.Pathak.com/legal.